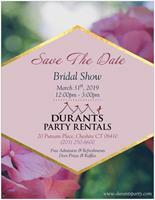 Cheshire, CT (February 04, 2019) – Durants Party Rentals is pleased to announce that we will be hosting a bridal show at our newest location at 20 Putnam Drive in Cheshire from Noon to 3:00pm on Sunday, March 31st, 2019. We look forward to meeting you this coming Spring at our 1st Annual Cheshire Bridal Show, being hosted under one of our stunning sailcloth tents. Durants will be showcasing some of the unique products and services that we, and a variety of excellent, experienced vendors in the industry, have to offer, to include caterers, entertainment vendors, wedding planners and venues. Whether on the waterfront, at a winery, or in a charming old barn, the options for a perfect location to say your “I dos” are seemingly limitless. Your engagement season is a special time in your life – our wedding professionals are available to assist you with all essential planning activities, to help allow you to enjoy and celebrate that time more! Attending a bridal show also affords you a great opportunity to compare products, services and pricing amongst event rentals, local catering and other bridal vendors. We at Durants Party Rentals are experienced in hosting bridal shows, being in the fifth year of our successful bridal show held at our Wappingers Falls location, which takes place from Noon to 3:00pm on February 17th, 2019. The Cheshire show is free to attend (brides may register at https://www.durantsparty.com/) and will feature a raffle giveaway of vendor prizes. We also have limited vendor space still available; please contact us at (203) 250-6600 for further details!